I was recently having a conversation with a friend who is on her way to get an MFA in printmaking, and she asked me about the concept of “outsider writers”; that is, writers who find success without the training of several years in academia. It seems that there is definitely a desire for fresh, “un-trained” voices in the literary community, but those voices still need a little structure, some resources to help develop natural talent. It sounds like Wiggerman gets this, and has written an outsider poet’s guide to poetry. Thanks for such a great book recommendation. I love that the book is a compilation of academic and non-academic poets. One of the biggest challenges for students of poetry is that we spend most of our time in college studying poetry of the past. 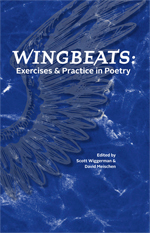 While studying the poetry of the “past” provides a necessary footing for understanding the poetry of the present, I feel like there aren’t enough classes that teach us how to critique, write and conceptualize (through literary theory) contemporary poetry.Scott Wiggerman and David Meischen’s Wingbeats might prove to be just the thing—with “new strategies for revision, collaboration, and inspiration” in addition to standard poetic techniques. I look forward to seeing it in book stores soon. This is a great book recomendation I feel like there are less and less people coming out with poetry books and I am excited to see someone giving people the help they need to develop their skill. I feel the key crucial thing I read that makes me want to read this book is the fact that it has information from academic and non academic poet’s. The difference between those two types of poetry I feel is tremendous. This all in all seems like a great book review.